GUIDE PRICE £380,000 to £395,000. Wow! What a house this is! This impressive five bedroom detached family abode is delightfully extended, giving not only a good sized family home but with the added benefit of separate living accommodation; ideal for a teenager or relative to be given independent living! Set in a prime location not far from handy amenities, public transport, local schooling and commuter links. 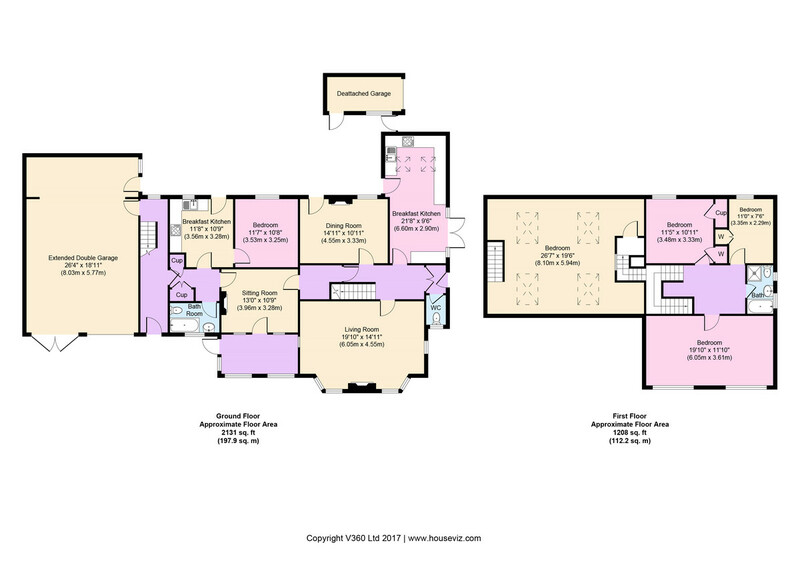 Interior: porch, WC, hallway, living room, dining room and beautifully refitted breakfast kitchen on the ground floor. Off the first floor landing is three bedrooms and family bathroom. Up second set of stairs to spacious fourth bedroom. Living annexe accessed from the main hallway or outside comprises living room, conservatory, breakfast kitchen, bedroom and bathroom. Exterior: plenty of secure parking, well planned garden areas and a large double garage with additional single garage at side/rear of the property. Viewing is simply essential! ENTRANCE & OPEN PORCH A welcoming entrance having paved access under gated pagoda style open porch to the main hardwood part glazed entrance door which opens into the porch. Door on the immediate left into the WC. Double opening doors open ingot the entrance hallway. WC Handy cloaks room with uPVC double glazed frosted window to front elevation. WC, floating hand wash basin and central heating radiator. Tile effect flooring. HALLWAY An inviting entrance hallway with display plate shelf. Meter cupboard, central heating radiator and solid oak flooring. Part glazed doors off to the main rooms and a hardwood door that leads through into the independent living area/annexe. LIVING ROOM 19′ 10″ x 14′ 11″ (6.05m x 4.55m) A great room to relax in with two uPVC double glazed half bay windows to front elevation, along with side uPVC double glazed windows. Exposed beam style ceiling, plate shelf and television point. Beautiful original style fireplace with tiled insets and hearth, housing a working burner. Original wooden flooring. DINING ROOM 14′ 11″ x 10′ 11″ (4.55m x 3.33m) uPVC double glazed window and uPVC double glazed patio door opening to rear garden. Television point, central heating radiator and laminate flooring but boasting solid oak flooring underneath. BREAKFAST KITCHEN 21′ 08″ x 9′ 06″ (6.6m x 2.9m) A beautifully re-fitted and tastefully chosen breakfast kitchen having great selection of matching high gloss base and wall units with chunky chrome handles and light granite effect surfaces over, which extends into a handy breakfast bar with central heating radiator below. One and a half bowl sink and drainer with mixer tap over, sitting below uPVC double glazed window that looks out to the rear garden area. uPVC double glazed door also to rear with Velux windows above and a further double opening uPVC double glazed doors to side garden area. Space for a range cooker with oversized chimney style extractor hood above. Inset ceiling spotlights, integrated double fridge freezer and dishwasher. MASTER BEDROOM 19′ 10″ x 11′ 10″ (6.05m x 3.61m) A spacious master bedroom large enough for a dressing area also. Two uPVC double glazed windows to front elevation with central heating radiator. Picture rail, television point and telephone point. BEDROOM TWO 11′ 05″ x 10′ 11″ (3.48m x 3.33m) uPVC double glazed window to rear elevation. Picture rail, central heating radiator and handy fitted storage cupboards housing the combination boiler. BEDROOM THREE 11′ 0″ x 7′ 06″ (3.35m x 2.29m) uPVC double glazed window to rear elevation with fitted wardrobe storage and central heating radiator. Loft access with pull down ladders. Secret door leading to storage in eaves. FAMILY BATHROOM A modern style re-fitted family bathroom with two uPVC double glazed windows to side elevation. Suite comprising tiled panel bath having shower attachment, corner shower cubicle, low level WC and an oversized wash basin set into a handy storage unit. Inset ceiling spotlights, ladder style radiator and tiled walls with tiled flooring. BEDROOM FOUR/LIVING AREA 26′ 07″ x 19′ 06″ (8.1m x 5.94m) Accessed from the main landing and up the second set of stairs with door into this spacious room. Four Velux windows, two central heating radiators and inset ceiling spotlights. ANNEXE Independent living annexe accessed from either the main ground floor hallway or via an external entrance. CONSERVATORY 13′ 0″ x 6′ 08″ (3.96m x 2.03m) uPVC double glazing looking out to garden areas and uPVC double glazed door to outside. Central heating radiator and laminate flooring. BEDROOM 11′ 07″ x 10′ 08″ (3.53m x 3.25m) uPVC double glazed window to rear elevation with central heating radiator and laminate flooring. BATHROOM A well-chosen modern bathroom with uPVC double glazed window. Suite comprising deep fill bath with shower and screen, low level WC and pedestal wash basin. Central heating radiator, extractor fan and tiled walls with tile effect flooring. DOUBLE GARAGE/WORKSHOPS 26′ 04″ x 19′ 0″ (8.03m x 5.79m) A huge garage area ideal for numerous vehicles and great for storage if required. Electric up and over door to one access point with double opening doors to the second. Power, lighting and handy workshop with storage areas. Door leading out to rear garden. SECOND GARAGE The added bonus of a second and original detached garage with doors, window and power. Driveway provides access on Blackheath Drive. REAR EXTERIOR A good sized area with a mix of paved patios ideal for table and chairs set, lawned area and a fantastic pond with surrounding paving. Hardstanding for shed and access gate to side gardens. SIDE EXTERIOR A great side garden area with a lovely and well-designed raised decked patio area boasting external lighting and external power. Access into the kitchen, making the side garden a great place to entertain, to host those family BBQs or just enjoy some alfresco dining over the summer months. Side access gate to detached garage and further wrought iron gate to front areas. FRONT EXTERIOR The front has a real private feel to it, set behind boundary fences. The two driveways are accessed via large double opening gates and can fit numerous vehicles on each; when looking at this impressive building the double garage is on the left hand driveway. Good sized lawned area with flower/shrub borders.